I spent Day 25 of Odyssey Dawn/Unified Protector at Trapani-Birgi, one of the most active forward operating bases for the Libyan crisis. 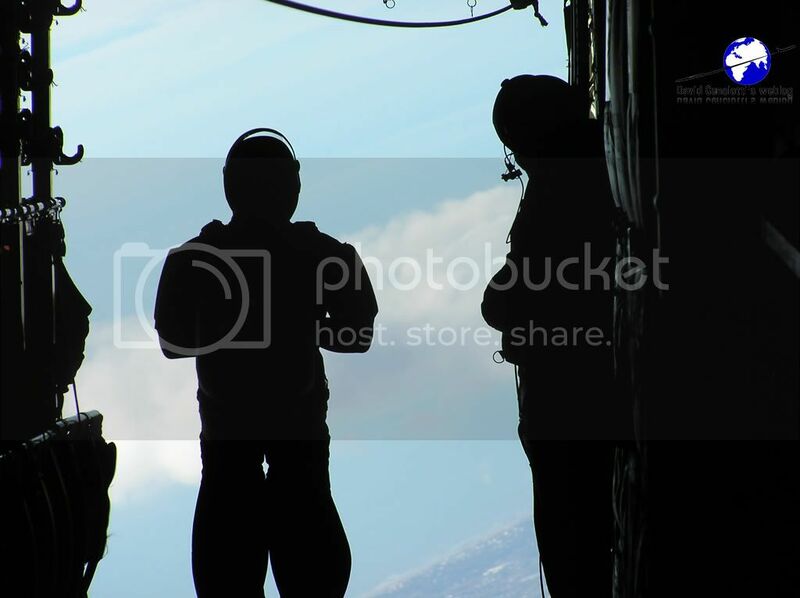 The airbase is the operative headquarters of the Italian Air Force contingent, to be soon become a Task Group “Air” and put under the direct command of Col. Mauro Gabetta, Cdr of the 37° Stormo. The base permanently hosts the NATO Forward Operating Base and, since Odyssey Dawn began, the Task Force Libeccio, the air detachment of the Canadian Armed Forces deployed on Operation Mobile. The overall flying activity was pretty intense on Day 25 with several Tornado ECR and IDS missions since early morning, a CC-150 tanker sortie and 2 RAF VC-10s sorties plus the usual training activity of the local based 18° Gruppo with its F-16 ADFs. The Typhoons did not fly until the evening, most probably because scheduled for night CAPs. As the 37° Stormo PAO, Lt.Col. Di Battista explained: “there’s no fixed schedule since the operative activity depends on NATO taskings. There are days in which the flying activity is mainly during daylight and others when it is shifted towards night”. The base is operative on an H24 basis. 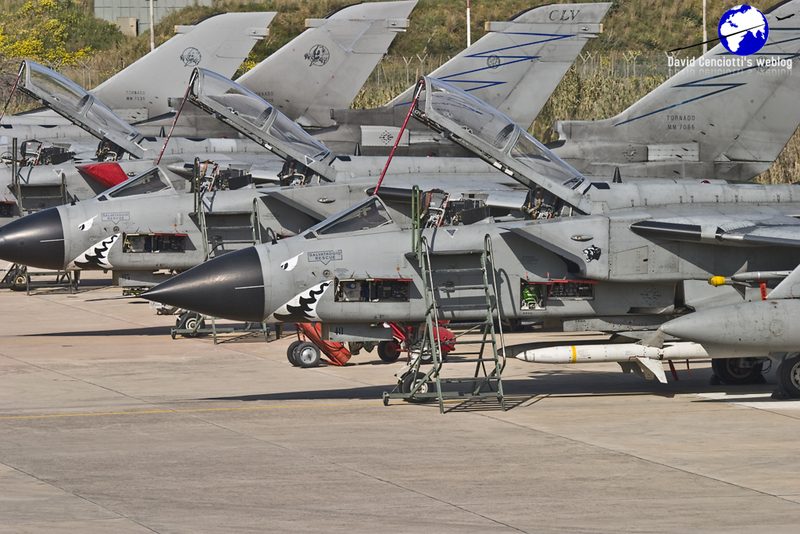 Hosted in the 82° CSAR apron are the Tornado ECRs of the 50° Stormo and the Tornado IDSs of the 6° Stormo assigned to NATO to perform, respectively, Suppression of Enemy Air Defences and reconnaissance missions. 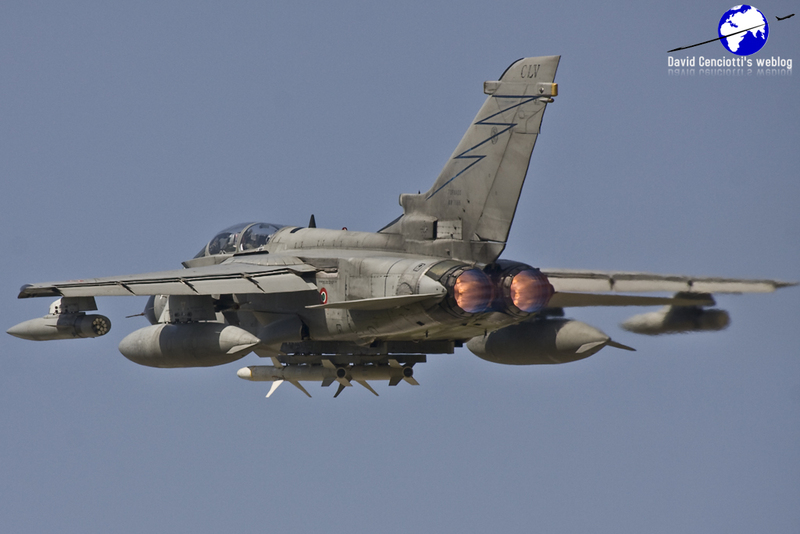 SEAD missions are flown with the standard load of 2 AGM-88 HARM missiles, while the recce see the Tornado IDSs flying with the Reccelite pod on the right underfuselage pylon. 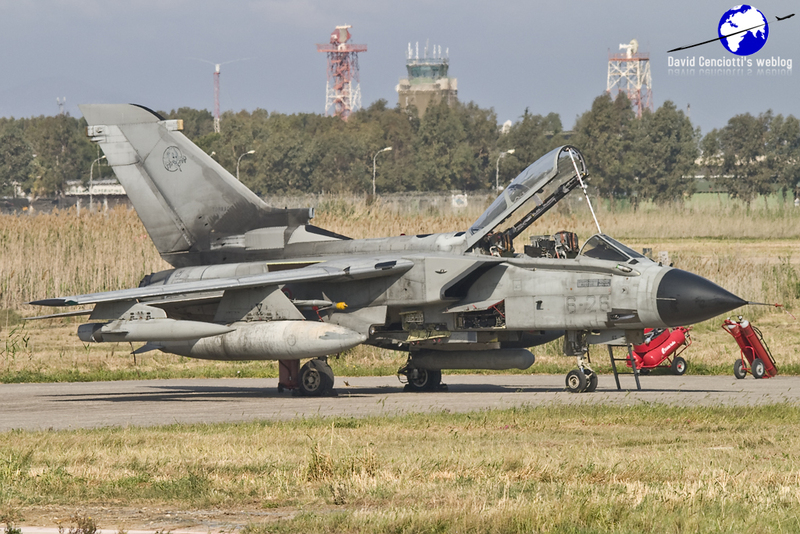 Deployed to Trapani but not assigned to NATO (hence operating under National command) are also the IDSs performing air-to-air refueling in favour of other Tornados (both ECRs and IDSs). Also flying under Italian command although supporting Italian sorties tasked for Unified Protector is a single KC-130J of the 46^ Brigata Aerea, initially deployed to Trapani, but currently operating almost exclusively from Pisa airbase. Next to the Tornados, the HH-3Fs of the local 82° SAR Center ensure a raised level of readiness for SAR missions needed to search and rescue any crews in emergency. Eight Eurofighter Typhoons belonging to both the 4° and 36° Stormo (4 of which assigned to NATO) operate from the 18° Gruppo that has flown the F-16s over Libya until the beginning of Unified Protector. The Typhoons are flying in the “heavy” configuration already mentioned in the daily debrief some days ago, with 4 AIM-120s, 4 IRIS-T and 3 drop tanks, while the F-16 flew with 2 drop tanks, 4 AMRAAMs and 2 AIM-9Ls. 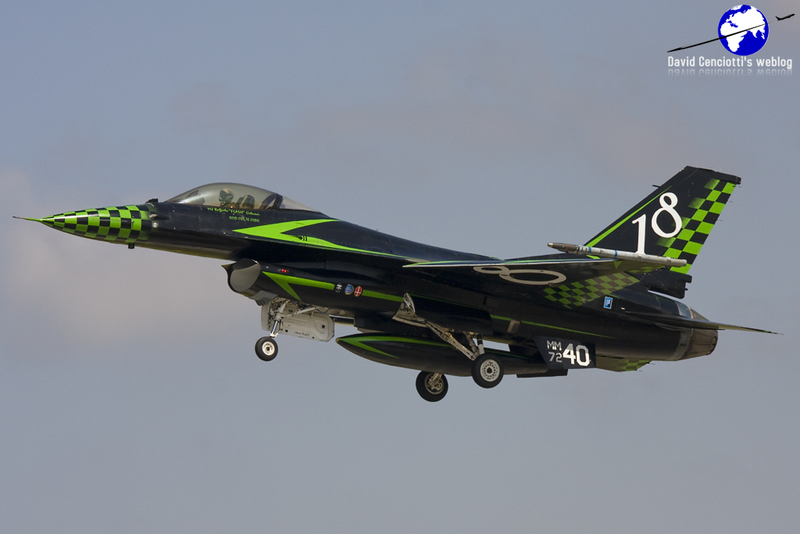 With the end of the activities for Odyssey Dawn some F-16s have been assigned to the QRA service while the remaining ones are flying standard training sorties. 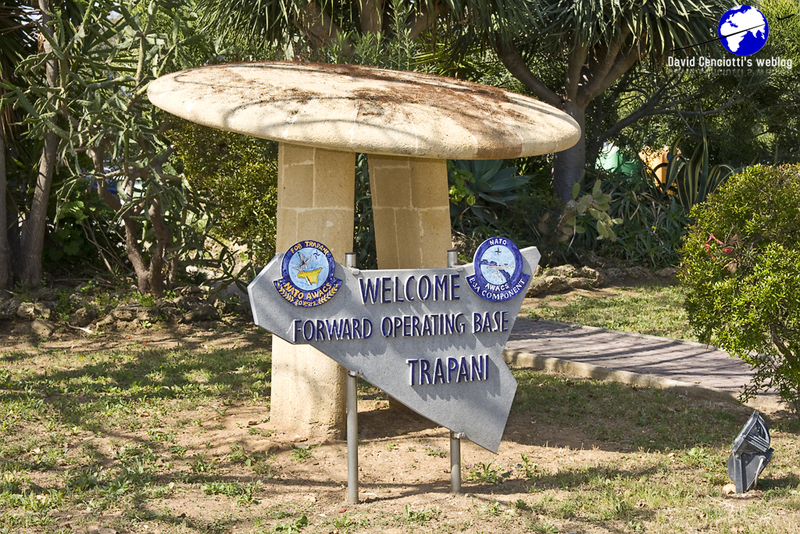 Trapani is currently being the base of Op. 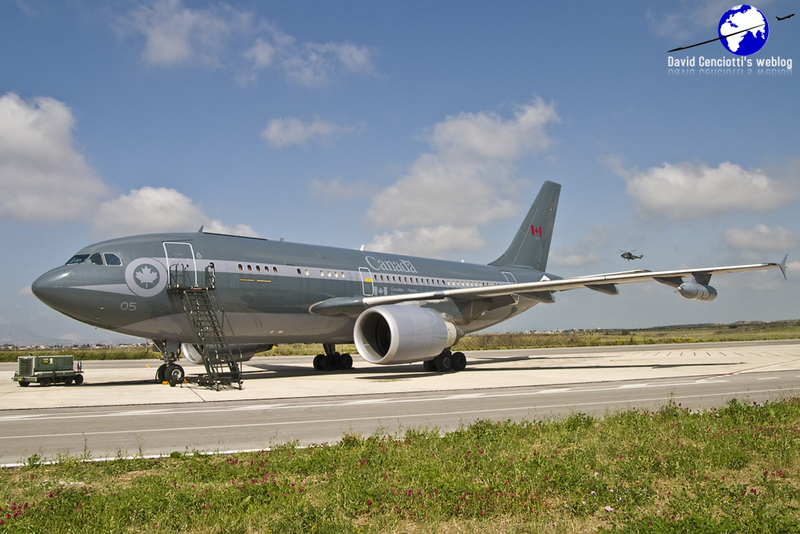 Mobile, the Canadian Air Force mission, with 7 CF-18s involved in the air-to-ground role and 2 CC-150 (A310) used for air-to-air refueling. While the tankers are parked in the civil apron, the Hornets use the Zulu apon located on the western side of the 13/31 runway. 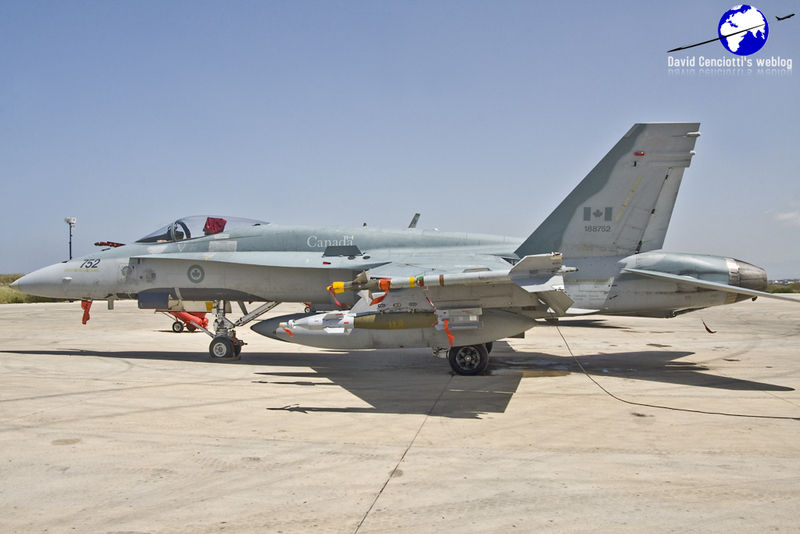 Actually, 6 CF-18s are assigned to NATO to perform daily sorties in Libya, one being used as a spare. The CAF detachment uses the local hangars (assigned to the HH-3Fs of the 82° Stormo before it moved to the southeastern part of the airport) to perform maintenance activities as well as to store equipment and parts, besides a few containers hosting the operative facilities of the Canadians and a tent for the mess (supplied by a local catering service). The aircraft are not necessarily always flying day and night missions but they perform missions according to the NATO taskings. For instance, during my visit, while all the 6 were checked and fully armed, 2 aircraft (+1 spare) were on-call meaning that they could be ordered to take off to relieve other flights performing combat patrols and intervene on targets of opportunity if needed. Indeed they were ordered to depart only in the late afternoon. The aircraft are armed (as the remaining 4) with 2 AIM-9Ls, 1 AIM-120C, 2 GBU-12s, a Sniper XR pod and 3 drop tanks, a heavy configuration slightly different from that used during the first days of the air campaign, when the planes of the 425 Sqn flew with 4 GBUs and 1 drop tank. As of Apr. 12 at 23.59 UTC the CF-188s have flown 98 sorties, while the CC-150 43 sorties. Belonging also to the Task Force Libeccio, but deployed to Sigonella, a CP-140 Aurora detachment made up from 405 Long Range Patrol Squadron at 14 Wing Greenwood, Nova Scotia, and 407 Long Range Patrol Squadron at 19 Wing Comox, British Columbia, flying maritime patrol missions in the embargo zone at sea has flown 16 sorties. Another interesting guest of the base is the NATO Forward Operating Bases with dedicated areas and facilities (other FOBs in the Med. being Konya and Preveza). The base is a sort of extraterritorial place (in fact, I was escorted in the apron by Capt. 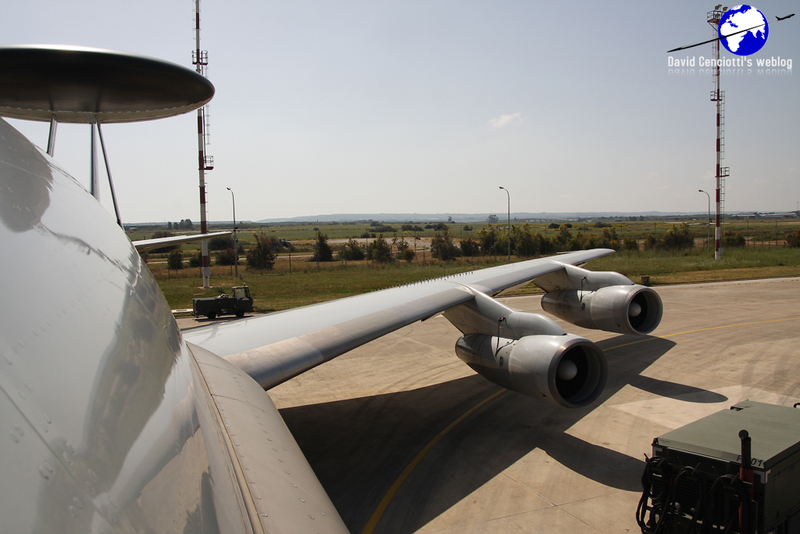 Wilko ter Horst from NATO E-3A AWACS Component Public Affair Office. Currently being hosted by the FOB are 5(!) E-3s in both A version (used by NATO) and D version (used by RAF): 3 (out of 17) NATO’s and 2 (out of 7) RAF’s ones. That’s the maximum number of E-3s that can be parked and moved in the (relatively) small apron of the FOB, the same it was reached in 1999 during Allied Force operation. 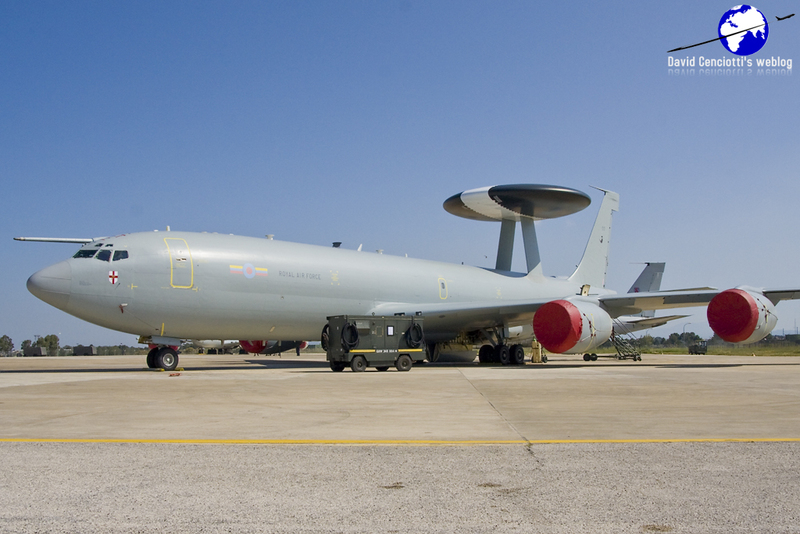 In fact, from a few days, the British E-3Ds, previously detached to Akrotiri, where moved to Trapani, where, thanks to the similiarities between the A and D version, they can benefit of the installation that is tailored to manage and service the “Sentry”. 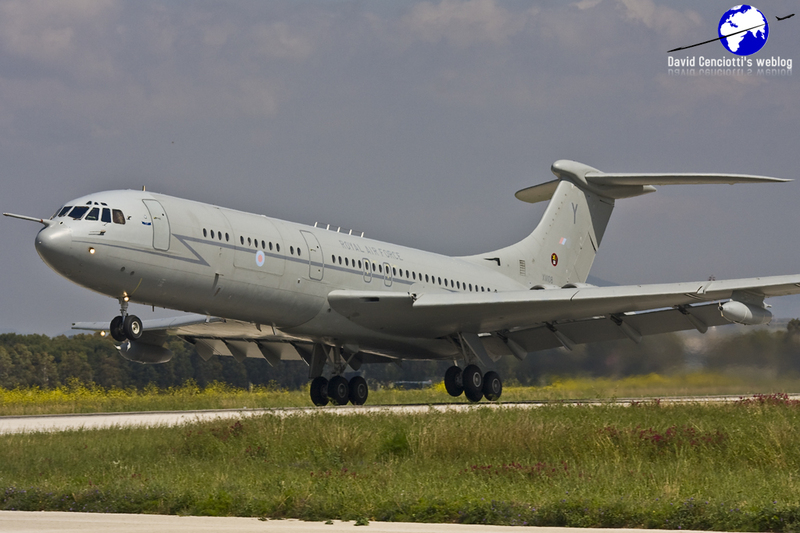 Dealing with the two different types of aircraft, externally, besides the Luxemburg civil registration (NATO is an inter-governative organisation that cannot certify a fleet hence the aircraft are registered in Luxembourg, a partner without its own air force, and each plane carries), the royal Luxembourg lion emblem on its vertical tail and the NATO markings, the A differs from the D version because of the obsolete (and smoky) engines and the type of air-to-air refueling system: the A has a receptable and can be refueled by those tankers equipped with a boom while the D model has a probe, that is suitable for the hose and drogue capable tankers. 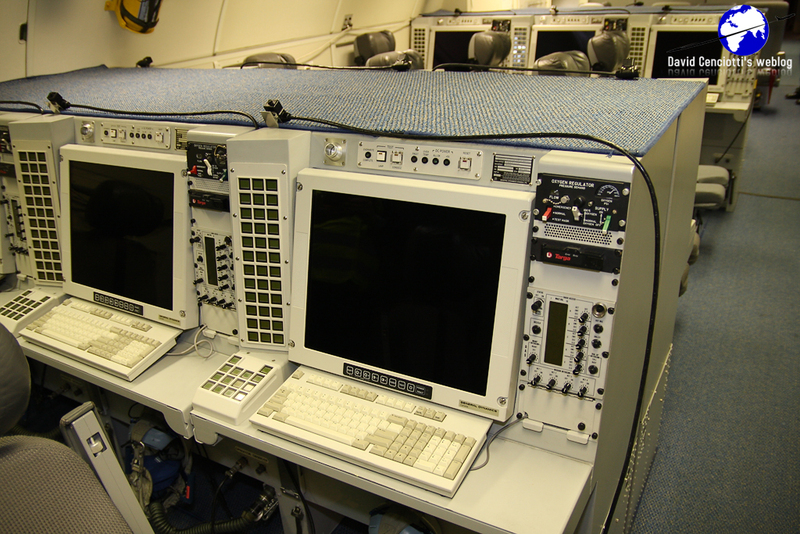 For what concerns the internal layout, it is similar (as the one of any other AWACS platform) even if the software used by the consoles in the Sentry AEW.1 (British designation for E-3D)is more modern than the one running on the older E-3A. 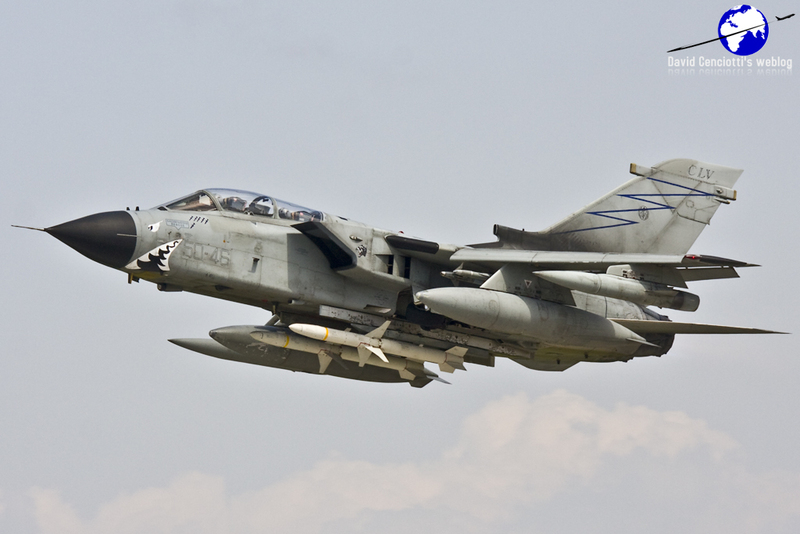 The RAF fleet is assigned to the 8 Sqn based at RAF Waddington, while the NATO one is based at Geilenkirken in Germany. 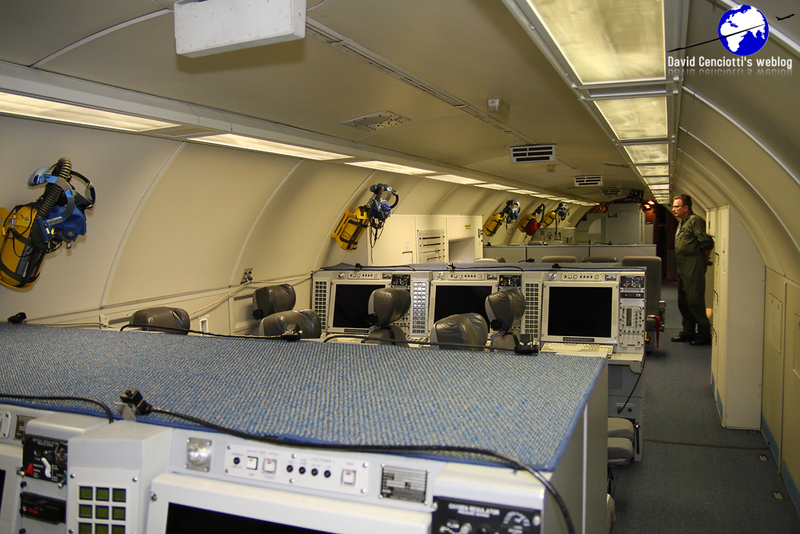 Walking inside the cabin of an E-3A from the cockpit to the tail, you find the communication and data processing equipment and then you reach the main body of the aircraft, where display and control consoles of the mission crew are located. As Capt. ter Horst explained, along with pilots (aircraft commander and co-pilot), navigator and engineer, who serve in on the cockpit, on board an E-3 a mission crew operates under command of a Tactical Director. The mission crew consists of a surveillance team, a passive detection controller (responsible of the on-board ESM system needed to improve the situational awareness and to update the Electronic Order of Battle), a weapons team (controllers that are responsible for the management of the various flying assets in the different scenarios: DCA, OCA, CAS, BAI, CSAR, etc), a communications operator and some technicians that are responsible for both the radar and the consoles/displays. 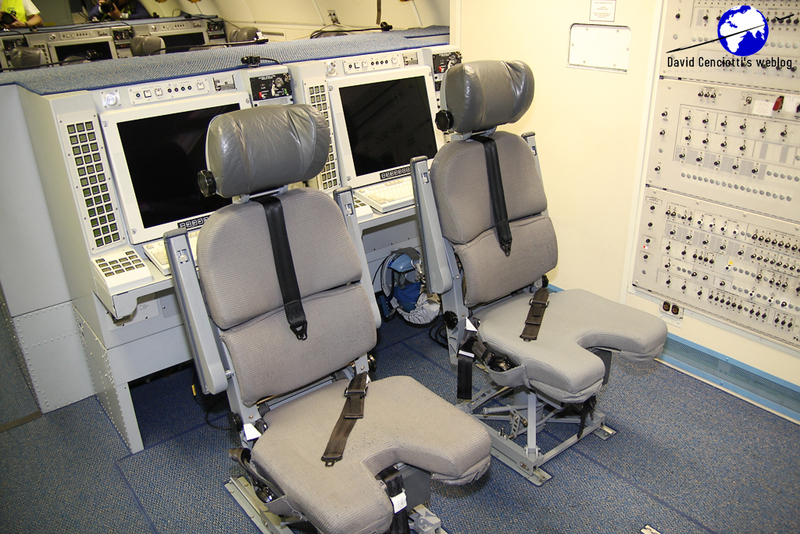 Since the aircraft can be refueled to fly missions that can last much more than 8 hours, the aft part of the cabin, along with the restroom, houses some retractable beds, more comfortable seats/armchairs and a kitchen equipped with an oven. The Day was characterized by the critics to NATO coming from both the French and British foreign ministers who said that the alliance is not doing enough to destroy heavy weaponry used by Gaddafi’s forces. They urged NATO allies to do more to protect civilians and to intensify military operations against the Libyan regime. Brig. Gen. Mark Van Uhm, Chief Allied Ops at SHAPE, rejected French and British criticism saying NATO is successfully enforcing the arms embargo and the No-Fly Zone as well as protecting civilians in Libya. Meanwhile, fierce fighting took place at the gates of Ajdabiya, where Gaddafi’s forces continued to attack rebel positions and lines, and in Misratah, under artillery attack. Since the beginning of the NATO operation (31 March 2011, 08.00GMT) a total of 2038 sorties and 832 strike sorties were conducted by the alliance. On Apr. 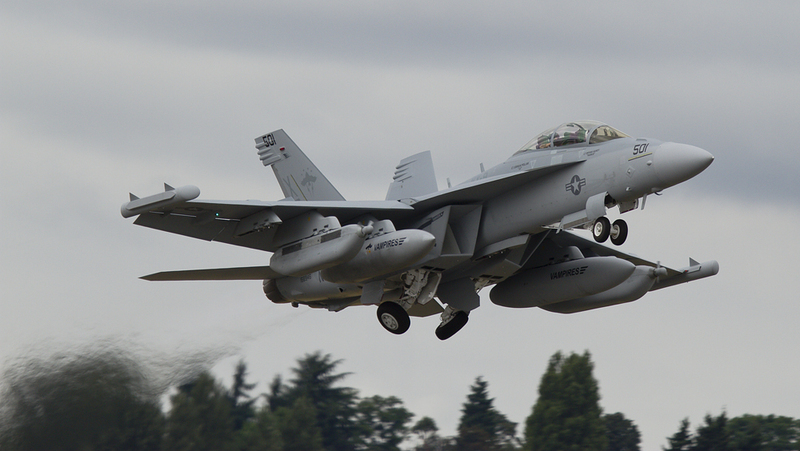 12, NATO flew 159 sorties, 60 of which were air strikes. Noteworthy, in the daily report NATO’s website provided a few more details about the target struck: 12 tanks destroyed in the vicinity of Misrata; 4 tanks and 1 pick-up truck with an anti-aircraft gun destroyed southeast of Sirte. 1) Chief of the air staff Air Chief Marshal Sir Stephen Dalton, during the Royal Aeronautical Society’s Aerospace 2011 conference in London revealed that two RAF Typhoons, each dorpped one Paveway II 454kg (1,000lb) bomb against loyalist ground vehicles that were successfully and accurately destroyed. The strike represents an important milestone for the multi-role Typhoon whose debut in the air-to-ground role was on Apr. 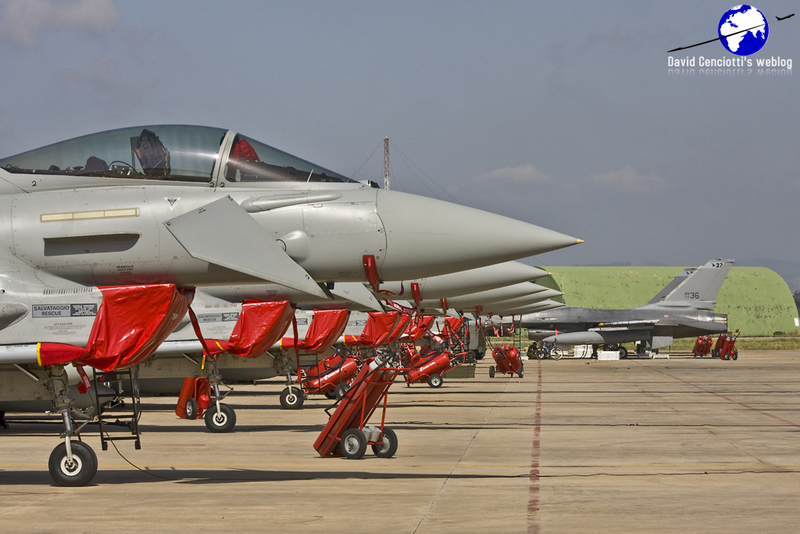 10, when F-2000s performed joint sorties with Tornado GR4s also deployed at Gioia del Colle.